1. 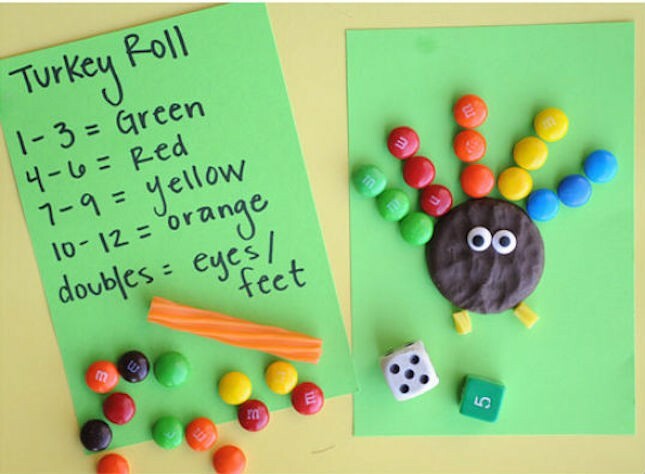 Turkey Roll: Not only will this activity keep the kids occupied, but it will also help them with their math skills. Now, if that’s not mom-approved, we don’t know what is. Roll two dice, add the numbers together and follow the chart. Whoever gets their turkey built first is the winner. 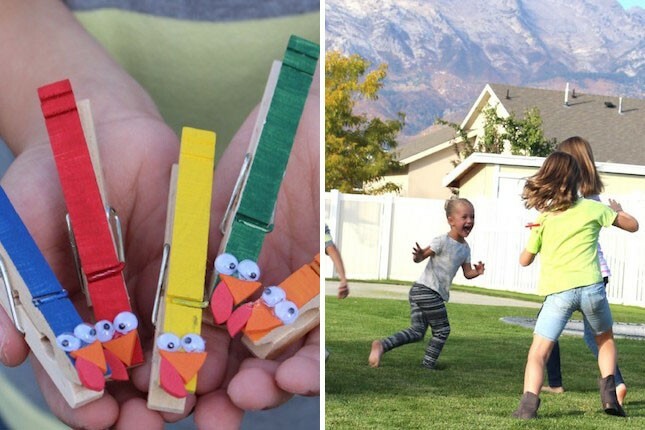 Use up your leftover Halloween candy to make putting this game together even easier. 2. 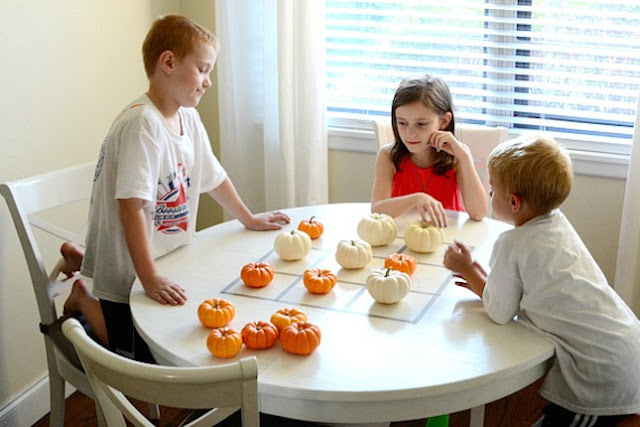 Tic-Tac-Toe: Slap a couple pieces of washi tape down on a tabletop, grab a few pumpkins from your mantel display and you’ve got yourself a game even the adults will be lining up to play. It doesn’t get any easier than this. We call winner! 3. Turkey Rockets: Incorporate a little science lesson about movement and force while having a ton of fun at the same time. You will need a bit of extra room for this activity, but it is too fun to pass up. 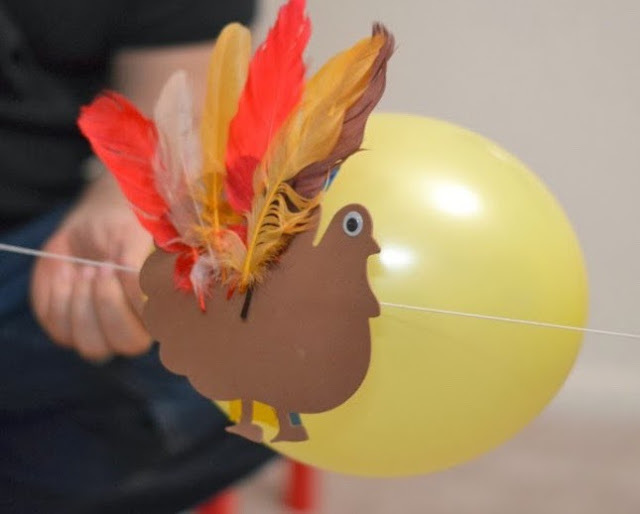 Attach a turkey to a straw and untied balloon, let go of the balloon and watch your turkey fly toward the finish line. Set up multiple tracks and let your guests race the day away. 4. Pretend Feast: Give your toddlers a chance to have their own (pretend) feast before the real one. They’ll learn what to expect at the dinner table and have a chance to practice their table manners. This is a great activity for the day before, when you have tons of prep work and need to give the kiddos something fun to do. 5. Turkey Bowling: Use colorful feathers and foam stickers to transform your kid’s bowling set into a bunch of turkeys. Now all you have to do is set ’em up and knock ’em down. 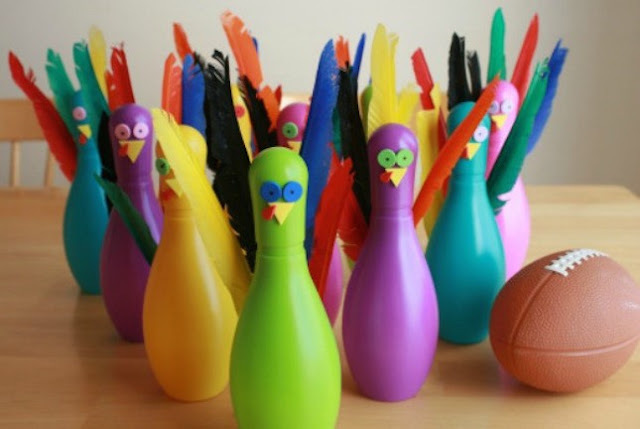 Use a football instead of a regular bowling ball to make things extra wacky and exciting. 6. 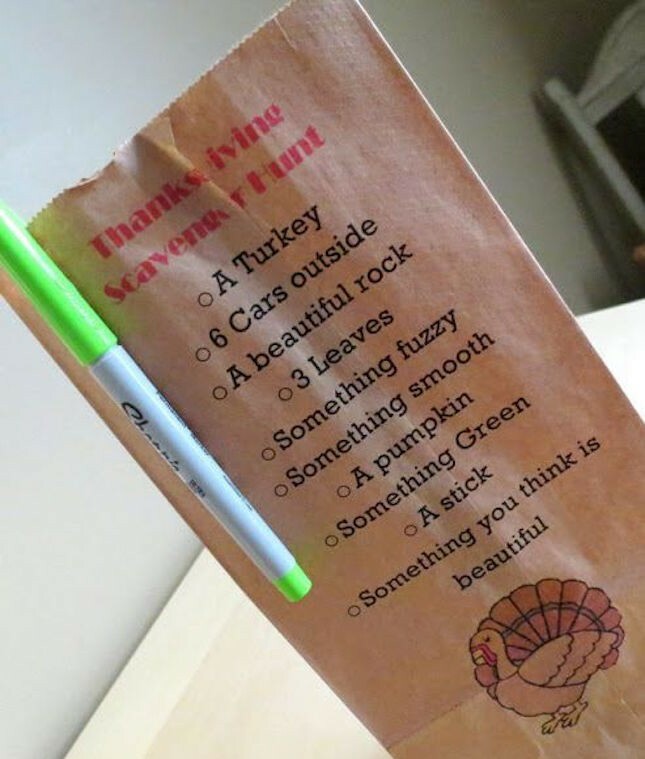 Turkey Hunt: Like an easter egg hunt with turkeys, this game is one the kids (and adults!) will love. 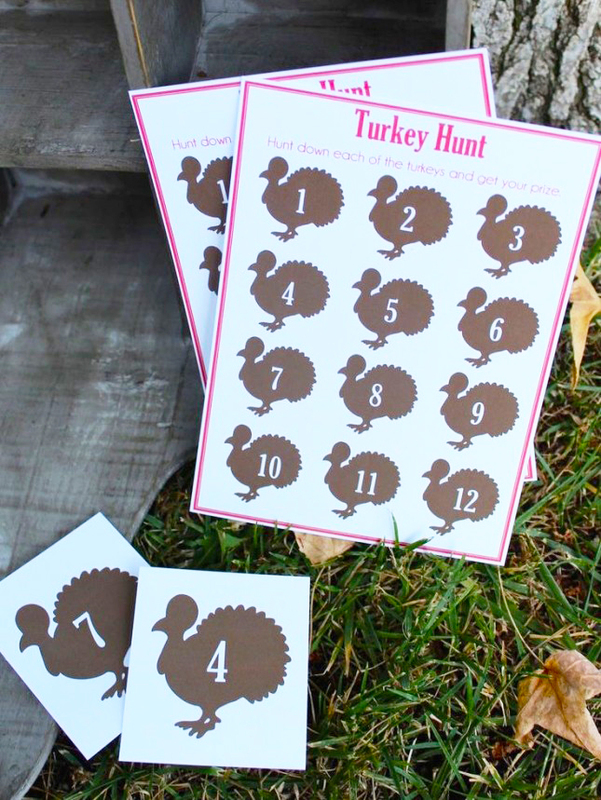 Hide the numbered turkeys around your yard, give each player a card and set them loose. The player who finds the most turkeys wins. 7. 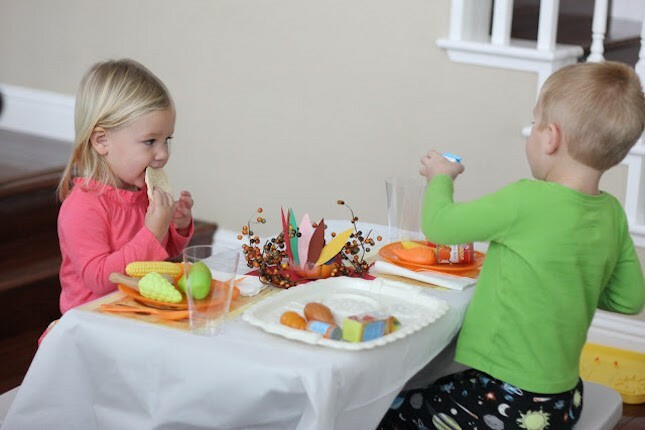 Thanksgiving Pictionary: This easy-to-put-together game is perfect for after the big meal when the adults are lounging on the couch and need something to keep the energizer bunnies (aka the kids!) busy. 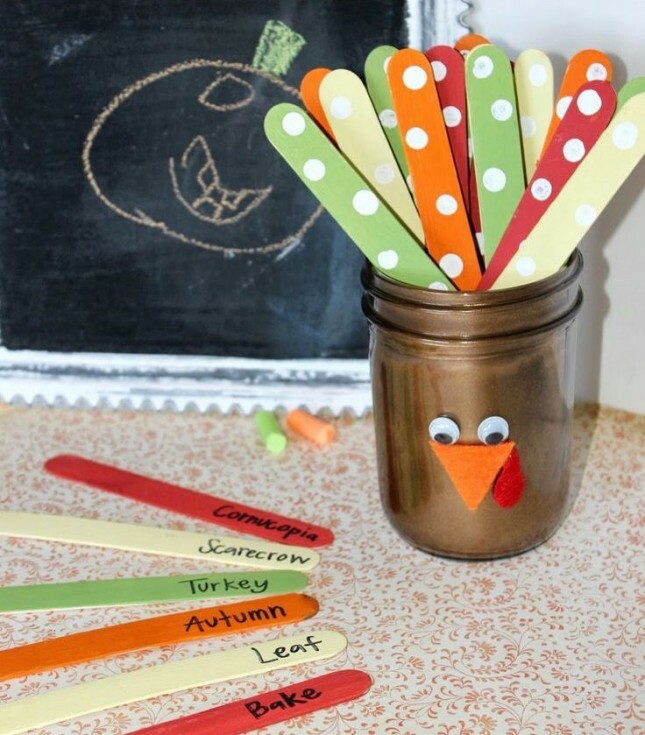 Paint popsicle sticks to look like feathers and write fall-related words on the bottom halves. Give the kids a chalkboard or even a big pad of paper and sit back and enjoy the show. 8. 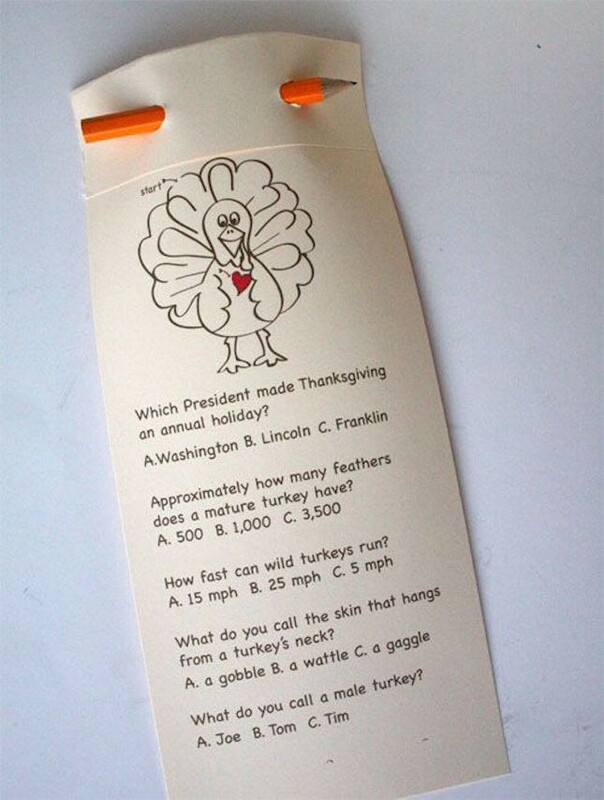 Thanksgiving Trivia: Pass out a little educational fun along with the dinner rolls. Print out the free template and use your hole punch to make a spot for the pencil. Designate a small prize for the winner and watch how competitive everyone gets. Just make sure you have extra for the adults, because they’re going to want in on the action too. 9. 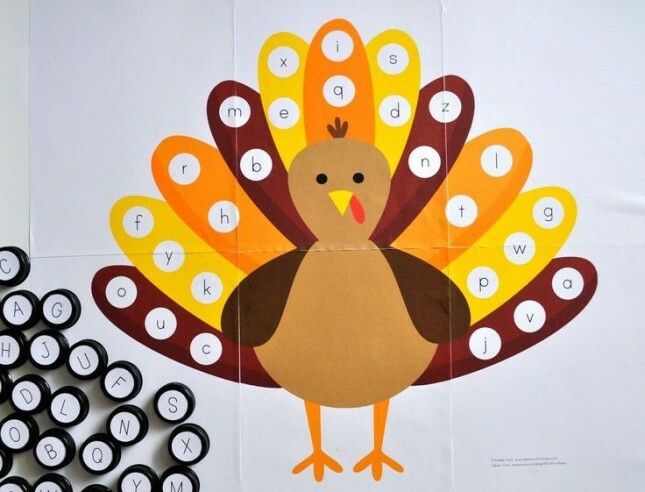 Alphabet Match: Great for little ones still working on mastering the ABCs, this uppercase/lowercase matching game will keep them entertained all afternoon. Print out the turkey template and attach it to a piece of poster board with recycled bottle tops to make the perfect base for the capital letters. With a little help, your toddler will nail those letters in no time. 12. 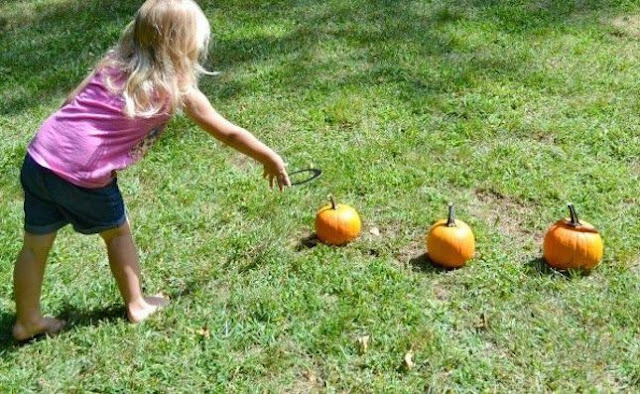 Pumpkin Ring Toss: If you’re scrambling to think of a last-minute activity to keep the younger crowd entertained while you set the table, look no further. A few pumpkins and rings are all you need for an afternoon of fun. Adjust the number of pumpkins or arrange them in a group and assign a different number of points to each one to switch up the rules a bit. The possibilities are endless. Will any of these games make the cut this Thanksgiving?